Now that there’s talk of a second stimulus package floating around (and we’d have to think it’s likely), it’s interesting to go back and look at this chart of the effectiveness of various stimulus options, as calculated by Moody’s Economy.com last January. 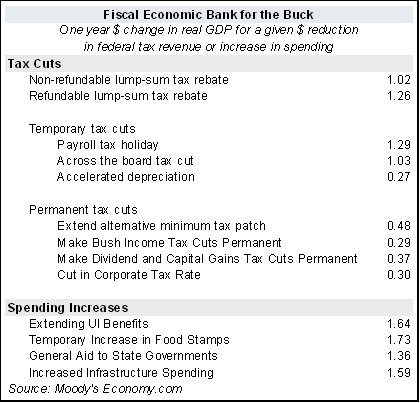 The measure is the efficiency of each option in boosting GDP, in dollars of GDP per dollar of tax cut or spending increase. The accompanying article has more detail, including a discussion of why an extension of unemployment insurance (UI) benefits or increased food stamps has more effect than simple tax cuts for rebates.